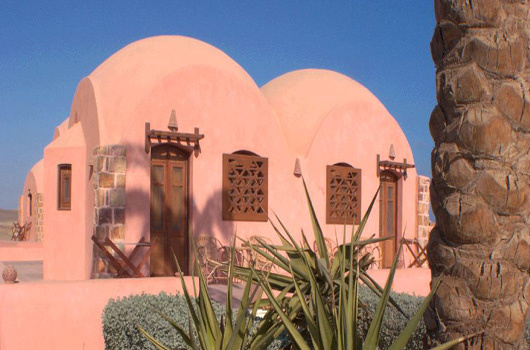 Built in attractive Arabic style the dome roofed deluxe en-suite chalets are very spacious with twin beds, wardrobes, and private sun terraces at the front and back with sea and desert mountain views. The Chalets are 24m² stone buildings with domed roofs. This desert styled architecture is very effective and stays cool enough without requiring air-conditioning. In addition there are two terraces of 8m² with bamboo chairs. One of the terraces has a mountain view while the other one is facing the sea. The chalets are large enough to take an extra bed and can be taken as a triple by arrangement. Ideal for familes. 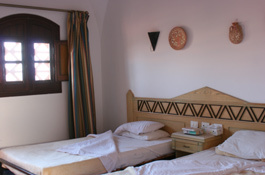 The chalets are en-suite with cold/hot shower and toilet, and are furnished with two beds, wardrobe, side table, dressing table with a mirror and a fan. The guests should bring their own towels for the beach. Towels are provided for showering. Sheets and pillowcases are changed regularly by our housekeeping team. 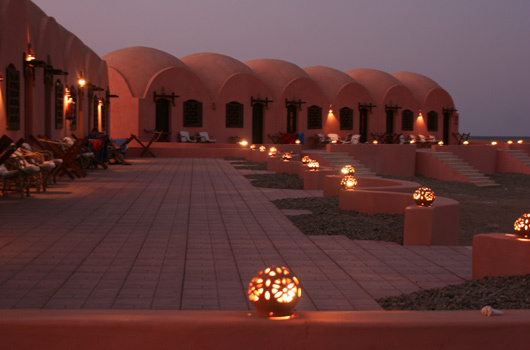 "Our Red Sea Dolphin Holiday has been crowned "Best Holiday Ever" with Khaled regarded as the Jewel in the Crown. He took such care making sure we were happy and fixed everything to our liking. Thanks again, we will return."